I thoroughly enjoy Two Worlds 2 despite the multiplayer that kept me off initially. In fact, Village Mode as a base of operations for what you do in multiplayer is a pure stroke of genius. Now that I have exhausted this I only crave more. Much more. Sadly there isn’t a whole lot of info on Village Mode out there, and while some are close, others are way off mark on the inner workings. Building, rebuilding and testing out every little facet while having spent more than one million gold, I think I have the solution. August 2013: Spreadsheet is now updated and working again. Sorry for the inconvenience! Many might skip this all together and just jump right into Deathmatch, but know that your online and offline characters are two separate entities. Whatever you do in the singleplayer campaign won’t matter online. While online you get 5 character slots you can fill with various builds, and they all share the single Village available to you. What you do in both Village Mode and Adventure Mode carries on to the character you use in Deathmatch, Duel and Capture the Crystals. Simply put, you need to make that armor, weapon and potions so you have a better chance of surviving multiplayer or Adventure Mode. And you get two achievements for building structures in Village Mode, one at 5 and one at 15. To begin Village Mode you need to create a multiplayer character and amass 10.000 gold. This is to afford building what the short tutorial tells you to. Easiest way to do this is to hit up a chum for some cash if available. Barring that, you need to earn it yourself. The first leg of Adventure Mode; The Way to Vokar, is a good way to get started. Simply play through that first part as many times as needed, saving all gear you find and selling it off instead of breaking it down. Once you have 10k coin on any one character Village Mode will unlock in the lobby. Once the tutorial is done we get down to the dirty work. There are a total of 26 ‘common’ building spots spread around the Town Hall where you can put whatever you like. In addition there are 3 spots around your village for specialty buildings; the Ore Mine, Sulphur Mine and Crystal Mine. In those last 3 spots only those buildings can be built. That makes your village up of 29 building total, or 30 if you count your mansion in the middle. Finding the right ‘build’ for your village is all about your needs. Buildings can be dismantled whenever you wish, but you will only get a 2000 coin refund no matter what the building’s initial cost. To make a proper village suited to your needs, you need to understand how it all works in relation. It can seem very complex at start, but I think I finally cracked the code to what’s really going on behind the scenes. Based on all the research and tinkering that have gone into this, I’ve made a spreadsheet you can find linked below. It covers almost all factors that goes on in your village, and all you have to do is enter what buildings you build as well as have an understanding of why things go wrong or why the numbers are off, since they will. The spreadsheet will hopefully show you everything else alongside this guide. Transactions: Money or income is made from Transactions and Transactions happen whenever a villager buys something that is produced. Produced items are Meat, Bread, Arms, Potions and basically anything you can output. Not all products will be bought though, and not every Transaction will happen regularly. Each Transaction being made each turn will net you an income of +100 coin. Turns: Village Mode separates between in-game and offline time. Online being you present in your village, mucking about and offline meaning you are off playing another mode, another game, or your box is turned off. A turn is 6 minutes on the internal clock in-game, or 6 hours off-line, meaning this is where your villagers will buy the things they need for that period and you will get paid accordingly. While you’re in-game playing in the village, you’ll get a turn every 6 minutes of play. When your Box is turned off, you still get turns every 6 hours so your Sims...err, villagers lives on when you sleep. Creepy. Village Chronicle: This is your overview of the village, a scroll you can read from your inventory. The tutorial will show you this - take note and familiarize yourself with it’s contents. Mapping the Chronicle to a hot-key will save you some time as you’ll be looking at it all the time. Demands: At the bottom of your Village Chronicle you can sometimes see what your villagers demand you build. These are based on their needs and will trigger on set conditions. If you don’t have certain buildings, they will be demanded either straight away or when the population reaches a certain number. If you don’t comply with demands you will suffer a morale hit until the demand is resolved. Not all demands give a negative morale and are considered suggestions. Demand for Shops is one such instance. If your transactions reach their max potential the entry in your Chronicle will turn red and a demand to build another Shop will appear. You don’t have to follow these suggestions if you are within your limits, like having equal food production to consumption, or your shops having 60/60 possible transactions. - If you build a Windmill the villagers will demand a Farm, with -10% penalty until you do. - If you reach max or above possible transactions, a shop is demanded without penalty. Morale & Safety: Your village’s standing morale simply shows you what your production level is at. It’s a bit intimidating to see it turn yellow or red, but don’t fret. If your regular production of Meat is 10 units and you have an overall Morale of 90%, it means you are producing 9 units every turn. That is nothing to worry about. What you need to worry about is having a low morale over several turns and depleting your stocks. Without stock there will be no transactions, and that is when your profit suffers greatly. Keep this in mind when growing your village as the villagers will put forth demands at set points that affects your morale. Stock: Once you are producing your first items, let’s say Meat, open the Chronicle and scroll down to the latter half. Each item you produce will be listed here. The first number is your current stock, and the second number in parenthesis is the adjustment happening next turn. The adjustment is hugely affected by morale, especially when an event happens in your village. What you need to always watch for is that your stock never depletes. Negative numbers in parathesis means you are consuming more than you produce, but unless this number is high compared to your stock of that item, don’t worry about it just yet. Max Auras: How much coin your village coffer can contain before the bald so called Village Leader starts skimming off the top. You start off with a 10K capacity and this is in turn increased by 500 for each villager. If you have 20 villagers the Max Auras amount you can store is 20K. Population: Every single building you build will come with one villager performing the job for that building. When you upgrade a building, two villagers will occupy the upgraded building. The speciality buildings cannot be upgraded, so that leaves a total of 26 upgraded buildings possible, plus 3 possible specialty buildings, or 55 max possible villagers. The ideal town however, usually has around 48-52 villagers. Upkeep: Some buildings have running costs each turn, like the Guardhouse and specialty buildings. It’s advisable to put down these buildings once you have a steady income to support it, otherwise you’ll be in the red rather quick. The upkeep on the specialty buildings are rather steep so it’s reccomended to save these for last and generally wait until you’ve stored away quite a bit of money. Producing the best items and earning good money is mutually exclusive. Placing: Has zero effect on anything. The only thing to keep in mind here is that it is convenient to group all the Shops and maybe a Tavern together. Saves you from running all over the place when it’s time for a shopping spree. This is what you will be building, from the simplest to the most advanced building and what they do in detail. All my village builds usually consists of 5 Industrial Ranches, 5 Industrial Farms, and 1 Industrial Windmill, taking up 11 of the 26 building spots, and negating other factors will give you a base +4400 income. This is most likely your starter building. It’s the simplest of buildings, comes with one villager at the cost of 2000, and produces 7 units of Meat each turn. The villager working there will consume one of the produced meats, so your excess output is 6 units. The Ranch can be upgraded to an Industrial Ranch for 6000 with two villagers and a production output of 8, minus the two pieces of Meat consumed by the workers. The production value of a Ranch is that every single one of your villagers, no matter if they work in the Tavern or on the Farm, will consume a piece of Meat each turn so keep that in mind. Again, every piece of Meat bought constitutes a Transaction earning you 100 coin. Also note that every Rancher villagers will buy bows & arrows every turn if you build a Quartermaster. The more Ranches you have, less bows & arrows will be available to you from stock. See the Quartermaster building for more info. When the other buildings are in place, the max possible income from an Industrial Ranch is 600. The two villagers in an Industrial Ranch will buy 2 pieces of Meat, 2 pieces of Bread, and 2 bows & arrows each and every turn. The second or third building you’re likely to build, but hold on a sec first and read up on Windmills. Farms are a step more advanced than the Ranch, in that they produce an unfinished product called Wheat. Other than that the numbers are pretty similar to a Ranch. Each Farm comes with one villager, costs 3000 to build, and produces 5 units of Wheat. Upgraded for 9000, the Industrial Farm will have two villagers and produce 14 units of Wheat. Farmers will also buy Arms from the Forge similar to the Ranchers and each Industrial Farm have a possible 600 coin income. A Windmill will come with one worker, cost 5000 and produces Bread from the Wheat your Farms are producing in the ratio of 1:1. A single Windmill can produce 35 units of Bread each turn, but only if you produce that much Wheat. Thus a single Windmill can support up to 5 single Farms. With several Farms and a Windmill in place you will see your first spike in income as every single villager no matter where they work, will also consume one piece of Bread every turn. Industrial Windmills cost 15000, comes with two villagers and can produce and support twice as much, delivering up to 70 Bread a turn. Be sure to also upgrade your Farms when you have upgraded your Windmill as you need to match the Wheat output to the production capabilities of the Windmill. An Industrial Windmill makes a lot of income, but not directly. The two villagers working there will net you +400 coin no matter the production. Note that you will not build the buildings in the order they are described here. Other buildings will have to be built in between, like the Guardhouse, Tavern, etc. Se Morale & Safety buildings. It’s a good idea to get to know the Basic Production buildings, Safety & Morale buildings, and your Economy buildings before moving onto Intermediate, Advanced and Specialty buildings. The Forge is a step up in complexity. It will cost you 5000 to build and comes with a 1000 coin upkeep cost every turn. If you don’t have the economy to support it, don’t build it. The one villager working the Forge will only make you 200 coin if you have Meat and Bread available, so unless you have villagers that will buy the items the Forge produces, you are looking at a -800 cost every turn. The Forge will produce 10 units of Arms (Armor, Weapons & Traps) every turn. Farmers and Guardsmen will buy these products every turn, one for each villager working your Farms and Guardhouses. If you skip back to the section on Basic Production, you’ll see I normally build 5 Industrial Farms. Those Farmers (2 pr. building) alone will consume the entire production of the forge, creating a +1000 coin profit, but also create a greater demand than supply. It’s important to remember to expand carefully. You can upgrade the Forge to an Industrial Forge for 15000 coin, but in the process you will incur another 1000 coin upkeep cost. Production will thankfully double, to 20 units pr. turn, and in most cases this will be enough to supply all your Farms and Guardhouses as well as adding a couple items to your stock (available to your character when you visit the shops). A fully upgraded Forge, with Farmers and Guardsmen consuming all 20 items every turn, will make your Industrial Forge profit by +400 every turn, from the food the workers eat. The -2000 upkeep is covered by the items sold. Like the Forge the Quartermaster Workshop will cost you 5000 and upgrades to a Quartermaster Mill for 15000. Production here is Bows & Arrows (quivers) and that is what will show up in your shops with excess production. In all terms but the product, the Quarternaster is identical to the Forge in how it works. Ranchers and Guardsmen will buy these products and the max profit is +400 if all 20 units are sold each turn. The production here is basic potions; the lowest entry versions you find in the campaign and Adventure mode. How these are produced and sold works a bit different from the Forge and Quartermaster. Potion output is 10 for Temple and 20 for High Temple, but the transactions that happens does not come from specific professions, but rather how many villagers you have living there. For every 3 villagers you have, one of them will buy a potion each turn. This is rounded down so 3-5 villagers will still buy a single potion, but when you hit 6-8 villagers they will consume two potions. To consume all the made potions you would have to have 60 villagers in your town and that’s not possible. There will always be some over-production of potions. If you break the numbers down for the Temple, a High Temple will never really make you any profit and you should only consider this if you are in need of basic potions for your character. If you are working on Adventure Mode chances are your character is already churning out potions so you really should have no need for a High Temple. A basic Temple will produce and sell their 10 potions each turn if you have 30 or more villagers, and the monk working there will buy two pieces of food turning a +200 profit. There are no complaints or negative effects if not all of your villagers have access to basic potions. These are the buildings you only build when you want something for yourself as these only incur profit loss. The buildings inner workings can also be hard to figure out. In it’s basic form, the Mage Tower will set you back 15000 and seem utterly useless at first. It produces 20 units of explosives - the exploding, direct-damage traps - each turn. How Explosives work will put most trying to figure this out off, as they neither show up as stored in your Village Chronicle, or add anything obvious to the economy. They do get stored in one of your shops and at the Tavern, but I’m guessing it’s either a bug or the thinking behind it is that it’s not that smart to store a load of bombs in one place. Instead, new Explosives will be produced each turn and made available, but not stored. Explosives will also affect your economy in a not so obvious way. Each time you build a new building, no matter what it is, 2 Explosives will be used from that turns production, but only once. This is probably what throws many off as your number of transactions will increase by 2 and show a +200 coin profit, but then next turn return to normal. I’m guessing this makes sense, but the validity of introducing a Mage Tower just for Explosives doesn’t do squat to your continuous economy as long as the Mage Tower has a -1000 upkeep each turn. In essence, you would have to build 5 buildings each turn just to break even. An Arcane Mage Tower will set you back a further 30000, produce 40 Explosives each turn, and cost you -2000 upkeep. Don’t dismiss the Mage Tower just yet though. As well when we are at Advanced Production, the Mage Tower is a required part of producing crystals. More on this under the Crystal Mine. Just know that crystal production is very expensive and the only thing the Arcane Mage Tower does should you shell out the coin, is double production at a higher cost. If you don’t plan on producing crystal(s) yet, hold off on the Tower until much later. The Hazel Grove requires a empty common building spot unlike the specialty buildings, and requires a Quartermaster Workshop or Mill to function properly. The Grove will set you back 15000 coin, comes with a hefty 3000 upkeep and cannot be upgraded. Hazel Groves will enable your Quartermaster Workshop or Mill to produce advanced Bows & Arrows (meaning higher level ones) at the tune of 5 units pr. turn. Now here’s the kicker - Guardsmen will buy one advanced bow every turn as well as a regular bow from the Quartermaster. What this means to your economy is that at the population level where you are likely to support a Haze Grove, most likely requires 6-8 Guardsmen. To be able to produce any advanced bows for yourself you need two Hazel Groves and now we’re talking -6000 upkeep a turn. In conclusion, only try to produce advanced bows for your Ranger-type character when you are at a point in your village building where you have a maximum of four Guardsmen, or in your finished village made for creating stuff for your Ranger character. Everything else will kill your economy. The Herb Plantation will enable production of Advanced Potions from the Temple or High Temple. On it’s own it will produce 10 potions of medium and high quality, and as with the basic potion production, your total amount of villagers decide how many are consumed. In this case, one advanced potion will be bought for every 10 villagers you have while the excess goes to stock. Since the max possible villagers you can have is 55, you will always have at least 5 advanced potions put into stock each turn. The Herb Plantation comes with one villager, costs 15000 to build, have a -3000 upkeep and cannot be upgraded. These are the three predefined locations on your map where only the following buildings can be built. Located to your far left, next to to the Sulphur Mine, the Ore Mine require a Forge or Industrial Forge to function, will set you back 15000, have an upkeep of -3000 and cannot be upgraded. This is the add-on that enables production of advanced Armor, Weapons, and Traps. It will produce 10 units each turn, and Guardsmen are the only ones buying these each turn so your stock will increase with whatever is left over. You can find this next to the Ore Mine and like the other specialty buildings the cost is 15000, upkeep -3000, and it cannot be upgraded. The Sulfur Mine connects to a Mage Tower and will produce advanced Explosives, or the higher level bombs of the Trap category. As with the regular Explosives and Mage Tower production, these doesn’t add anything worthwhile to your village. Only two buildings fall in this category and they affect morale. It’s advisable to read up on Safety & Morale under the ‘Key Concepts’ part at the beginning. The Tavern in itself is fairly expensive at 5000, bthat doesn’t produce or buy anything at first. It thankfully has no upkeep. Once upgraded to a Brewery for 15000, it will add Lock-Picks to your list of products and add a Thieves Guild trader in the back area where you can buy lock-picks and other sneaky stuff. No one but players will buy these so it doesn’t add anything to your economy other than a second villager. There is another reason for having a Tavern or Brewery though. At set amount of total villagers they will put forth a demand that you build a Tavern, and unless you do your overall production will drop by 10%. - At 18 total villagers, they will demand a Tavern built. - At 37 total villagers, they will demand a second Tavern, or a single Brewery. The Guardhouse will be one of the first buildings you build. They cost 2000 and upgrades to Sentry Posts for 6000. One guard will show up in it’s basic form and another when you upgrade. Each guard buys both basic Arms from the Forge and a Bow from the Quartermaster each turn if available. If you have the advanced versions the guards will also buy those in addition, so beware your production levels with many guards around. If you have all of these products available, each guard will account for up to 6 Transactions (2 foodstuffs, up to 4 Arms & Bows) and offset the -300 Aura upkeep so you end up earning +300 instead. Upgraded to a Sentry Post, another guard shows up, doubling the upkeep but also up to 6 more transactions so you end up earning +600 each turn for each Sentry Post all the while paying the upkeep. For a fully developed village it’s not uncommon to have as many as 4 upgraded Sentry Posts, so keep that in mind when planning ahead. As to filling the safety needs, the villagers will demand you expand your guard operation at set intervals and if you don’t meet the demand your production will suffer. These demands for protection are thankfully very specific so you can plan for it. - 4 villagers total will demand one Guard. Build a Guardhouse. - 12 villagers total demands another Guard. Build another Guardhouse. - 20 villagers needs a third guard. Build another Guardhouse or upgrade existing. - 27 villagers needs a fourth guard. Build another Guardhouse or upgrade existing. - 36 villagers demands a fifth guard. Upgrade. - 52 villagers gives the final demand for the seventh guard. Ignoring the demand, adjusting your total population down to 51 works, or simply build a fourth Guardhouse if production allows. All production buildings will of course affect your economy, but what ties it all together are the Shops or Commissaries. A Shop will set you back 3500 and upgrading to a Commissary will cost you an additional 10500. Shops have no upkeep. What these buildings do is allow for the very transactions to happen that will give you your income as well as being able to buy the excess items you produce. Each shop-worker will allow for 15 transactions to happen, and are able to store up to to 10 items. These two stats are found in your Village Chronicle and reads as current Transactions out of how many possible. You won’t see Max Stock other than when the stock is full; represented by the first number on all wares available at the shops. Bread and Meat will quickly give you a pointer what your Max Stock is. Be prepared to build a lot of Shops or you won’t get any income. Since each villager will buy 2 foodstuffs at bare minimum, a single Shop will in theory support 7,5 villagers. Keep checking the Village Chronicle and the amount of Transactions going on and be ready to expand at a moments notice. For comparison, my production village has 6 Commissaries and 175/180 Transactions each turn. Note that sometimes the Shops can be slightly buggy where the tradesmen will get stuck in the scenery and you won’t be able to trade with them. If that happens, try to build in another location, or tear it down, exit, and rebuild. This will net you a 8600 profit each turn and should have you rolling in coin in no time. If you sell an item from your inventory to a shop that one of your villagers needs (try to sell a potion that your guards use), a transaction will be added temporarily and will show up on your Village Chronicle. Look for negative entries in the second number in parenthesis for products you know you don’t produce. If something like Advanced Potions show up as 0 (-1) for the turn, it only means one of your villagers bought the potion you sold to a shop. The numbers will return to normal next turn or when you put down a new building. Sometimes the actual production will deviate, but turn back to it’s correct number the following turn. If morals are at 100% you might experience a boom in production when you enter your village from the menu. The actual mechanics behind this I haven’t figured out, but I am leaning towards a random boost. Below 100% Moral will produce less goods naturally. Events in the village, like any attack will temporarily lower production. If you resolve the matter before the next tick, it will normalize. Otherwise a negative effect will linger on until the next tick again. Regularly your villagers will come under attack from monsters tailored to the visiting characters level. The Village Leader will summon you and explain where and what is going on (with varying degrees of reliable intel mind you). Whenever that happens, your production will take a major hit until the matter is resolved. If you are actively playing in your village, resolving the situation before the next turn happens will leave a minimal impact on your economy. The Events happening is also a good source of experience and potion ingredients, as well as a measure of how you are going to fare in Adventure Mode. Spread around the village map are 11 hidden chests that can supply you with several advantages. First, they can supply that hard to find gear as well as higher level gear than the shops in Adventure Mode will have on offer. Second, these are the most convenient chests to practice lock-picking on. Third and last, when starting out, there will be some generic monsters to kill around the chests for experience. Beware though - sometimes the chests will spawn guardians that are most likely going to be a challenge until level 15+. Check the map for the locations of all chests. First column is used for entering how many buildings of the type you have and is the basis for figuring out how many villagers you have and what they consume. If you have one Farm, put 1 in the field before the Farm entry. If you upgrade to an Industrial Farm keep the 1 and add a 1 to the Industrial Farm entry below. If you had 4 Guardhouses but only 3 of them were Sentry Posts you would put 4 ahead of Guardhouses and 3 ahead of Sentry Posts, getting a correct 7 Guardsmen and their consumption levels. And there you go, a cool feature in an RPG that will help you greatly with Adventure Mode if you take the time to get into it. Comments are open for everyone so be sure to chip in if you have anything to add, have questions or anything else on your mind. you named 27 buildings, but there's only 26 spots to place them. I've counted that list several times, and still end up with 26 buildings for the 26 spots. Sure you don't anything else built somewhere that is taking up a spot? 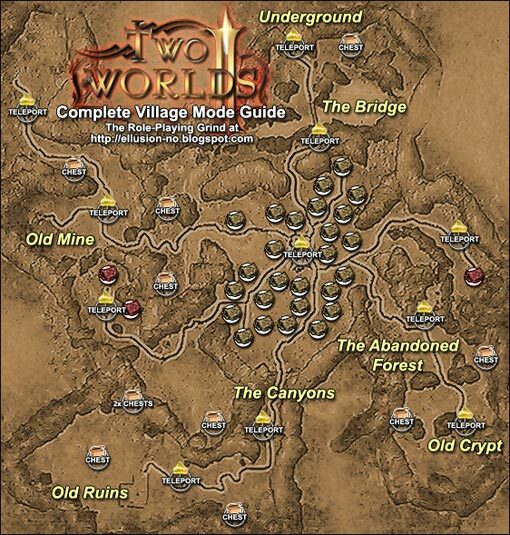 This is the best Two Worlds II Village Guide I've managed to find. You explain things logically and clearly - well done. No other guide I have read goes into remotely as much detail about shop transactions and their importance on the economy. Thank you for this! Now I understand the workings of the village and will be able to make the village fit me. The link to the spreadsheet is not working. The link for the spreadsheet no longer works! Please fix it, it would be incredibly useful! There is very little useful information out there about how village mode actually works; your blog post is by far the best resource I've found! Kudos for all the details! Where can i find the spreadsheet? the links seem broken. I cannot download the excel sheet, is the link still functional? Download link for the Excel file is not working anymore. Could somebody re-upload it somewhere again pls? Spreadsheet re-uploaded, sorry about that! Dubstep: Yes, you do in adventure mode.